Eric P. Whitaker joined the Bureau of African Affairs Front Office as Acting Deputy Assistant Secretary in January 2017 with East African Affairs, Sudan, and South Sudan. His previous position was Director of East African Affairs. Born in DeKalb, Illinois, he attended the University of Illinois, where he earned a BS in general biology and an MS in community health education. Eric thereafter earned a Master of Public Administration degree at the University of Pittsburgh and a Master of Public Policy degree at the Wilson School at Princeton University while serving as a Weinberg Fellow. Prior to entering the Foreign Service, he served as a Community Health Development Peace Corps Volunteer in the Philippines and as Assistant to the City Manager for the City of Lodi, California. As a Foreign Service Officer, Eric has held several positions: Consular Officer – Seoul, Korea; Refugee Affairs Coordinator – Khartoum, Sudan; Kampala, Uganda; and Zagreb, Croatia; Economic/Commercial Officer – Addis Ababa, Ethiopia; Political/Economic Chief – Bamako, Mali, and Maputo, Mozambique; Trade Policy Officer – Bureau for Economic and Business Affairs; and Political/Economic Counselor – Khartoum, Sudan. Eric also served a tour of duty as an Embedded Provincial Reconstruction Team (E-PRT) Leader in Baghdad, Iraq, heading an eight-member team composed of State, USAID, and DoD civilians. Covering the districts of Karada, Rusafa, and Tissa Nissan, the E-PRT supported local governance, economic growth and development, essential public services and infrastructure, and community reconciliation. In August 2008, he departed for Niamey, Niger, where he served as Deputy Chief of Mission and then as Chargé d’Affaires at the U.S. Embassy. In October 2010, he commenced service as Counselor for Economic Affairs at Embassy Nairobi, Kenya, our largest diplomatic post in sub-Saharan Africa. Thereafter he served as Foreign Policy Advisor (POLAD) at Combined Joint Task Force – Horn of Africa (CJTF-HOA) in Djibouti on Camp Lemonnier. Finally, from October 2012-2014, he served as Deputy Chief of Mission at U.S. Embassy N’Djamena, Chad, before returning to the Department of State. Eric speaks Portuguese, Spanish, French, Visayan, and Korean, and has received eleven Meritorious and Superior Honor Awards, as well as the Department of Defense Meritorious Civilian Honor Award. Peter Henry Barlerin of Colorado to be Ambassador Extraordinary and Plenipotentiary of the United States of America to the Republic of Cameroon. Mr. Barlerin, a career member of the Senior Foreign Service, class of Counselor, has served as an American diplomat since 1989. He is currently the Deputy Assistant Secretary in the Bureau of African Affairs at the Department of State, a post he has held since 2016. Mr. Barlerin also served as Deputy Chief of Mission with senior level appointments at the State Department. An economist, he has served at seven U.S. Missions overseas. Mr. Barlerin earned a M.A. from University of Maryland, College Park and a B.A. from Middlebury College. He speaks French, Japanese, Spanish, and Norwegian. The State of Foreign Service Family Member Employment 2013 — Where Are the Jobs? According to State/FLO, the total adult family member population of the Foreign Service in 2013 is 11,528. This number was 9,243 in 2007 and 9,819 in 2009. Family members are 78% female and 64% are not working. Male family members are slowly expanding in numbers; they constitute 20% of the family member population in 2007, 19% in 2009 and is up 22% last year. Of the 36% working , 24% works inside the U.S. mission with only 12% working in the local economy. The total number of family members employed was 25% in 2009. While more jobs have become available since 2009, the FS family member population has also expanded by 1,711 in the last four years. Of the 64% not working or 7,392 family members — the FLO data does not provide insight into how many of these have opted to stay home voluntarily and how many are interested in working but could not find work overseas. We should note that the State Department has created an Expanded Professional Associates Program (EPAP) for family member employment. These are professional level Foreign Service full-time positions, centrally funded by the Department of State and some through ICASS (as opposed to post-funded positions). But the program only provides “186 filled EPAP positions in total.” Not all family members would like to work, of course, but for those interested in professional level positions, 186 EPAP positions amount to a 1.6% drop in a universe with 11,528 individuals. The 2011-2013 data indicates that the largest number of FS family members at post is located in the EUR bureau (3,319) followed by the WHA bureau (2,716). However, the total number of family members employed at post is highest in the South Central Asia countries, followed by posts in Africa. The South Central Asia bureau only has 615 family members at post, the lowest number among regional bureaus but at 53%, it has the highest number of employment among family members. The SCA bureau includes Afghanistan and Pakistan where adult family members are allowed to accompany employees pending job availability at post and “M”bureau approval . A Blast From the Past: How to Purge a Bureau? Quickly. “Reflecting a perpetual annoyance with unauthorized disclosures, Kissinger purged several senior staffers from the State Department’s Bureau of African Affairs in December 1975, after U.S. aid to opposition groups in Angola leaked to the press. 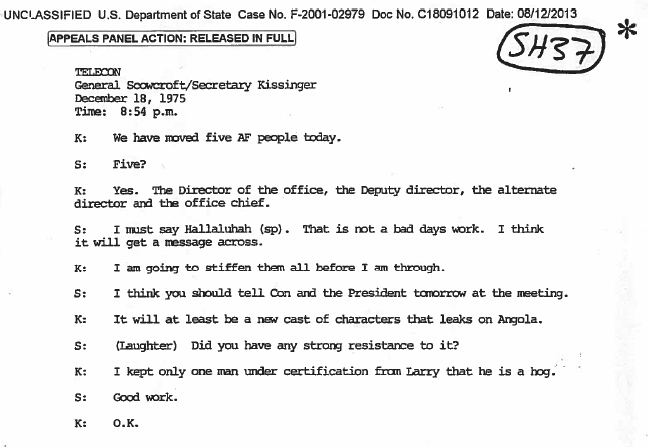 Kissinger told Scowcroft that “It will be at least a new cast of characters that leaks on Angola” [See document 7]. Below is the telcon between Scowcroft and Kissinger recently released by the Archive. For additional background on how these docs are able to get out of the lockbox, see here. The Secretary: The Department’s behavior on Angola is a disgrace. The Department is leaking and showing a stupidity unfit for the Foreign Service. No one can think that our interest there is because of the Soviet base or the “untold riches” of Angola. This is not a whorehouse; we are conducting national policy. The Secretary: I want people transferred out within two months who have worked on Angola. Did I cut off cables at that time? The Secretary: Even more repulsive is the fact that AF was quiet until Davis was confirmed and then it all leaked. If I were a Foreign Service Officer I’d ask myself what kind of an organization I was in. I’ll be gone eventually but you are people whose loyalty is only to the promotion system and not to the US interest. The Secretary: The DOD guy then says it’s between Henry and his Moscow friends. First I want discipline. Someone has to get the FSO’s under control. If they don’t like it, let them resign. Eagleburger: I have some ideas on that, Bill. The Secretary: I want action today. I am not terrified by junior officers. I want to discuss Angola. I’ve got papers on the UN and on the Security Council. I had a foretaste from Moynihan who had been brought into the discussions. The Secretary: Who will shape up the Department? I’m serious. It must be a disciplined organization. Eagleburger: The focus now must be on AF. Schaufele: I’m bringing the new director of AF/C back soon. Schaufele: Yes, he’s good and tough. He’s due out at the end of the month. The Secretary: Well get him back sooner and get Nat Davis’ heroes out fast. Schaufele: As soon as we can find replacements. The Secretary: No, I’d rather have no one. I want some of them moved by the end of the week. I want to see a list. I want progressive movement. Should I swear you in? The exchange above is from the Memorandum of Conversation (memcon) of that meeting, published by history.state.gov. Imagine if you can read these memcons a year or so after the top honcho’s departure from office and not after four decades? Operation IA Feature, a covert Central Intelligence Agency operation, authorized U.S. government support for Jonas Savimbi‘s UNITA and Holden Roberto‘s National Liberation Front of Angola (FNLA) militants in Angola. President Gerald Ford approved the program on July 18, 1975 despite strong opposition from officials in the State Department, most notably Davis, and the CIA. Two days prior to the program’s approval Davis told Henry Kissinger, the Secretary of State, that he believed maintaining the secrecy of IA Feature would be impossible. Davis correctly predicted the Soviet Union would respond by increasing its involvement in Angola, leading to more violence and negative publicity for the United States. When Ford approved the program Davis resigned. John Stockwell, the CIA’s station chief in Angola, echoed Davis’ criticism saying the program needed to be expanded to be successful, but the program was already too large to be kept out of the public eye. Davis’ deputy and former U.S. ambassador to Chile, Edward Mulcahy, also opposed direct involvement. Mulcahy presented three options for U.S. policy towards Angola on May 13, 1975. Mulcahy believed the Ford administration could use diplomacy to campaign against foreign aid to the Communist MPLA, refuse to take sides in factional fighting, or increase support for the FNLA and UNITA. He warned however that supporting UNITA would not sit well with Mobutu Sese Seko, the ruler of Zaire.